IBDoF Note: "Day of Honor" concept by John J. Ordover and Paula M. Block. Book Description (Amazon): To true Klingon warriors, no occasion is more sacred than the Day of Honor, when they pay homage to all that makes them Klingon. But honor demands its price.... Worf finds his honor tested when he goes undercover to infiltrate a planetary criminal network. How can he root out the corruption on Sindikash without resorting to deceit and treachery himself? Worf"s dilemma is shared by his son Alexander, who searches for the true meaning of honor in his own human heritage. 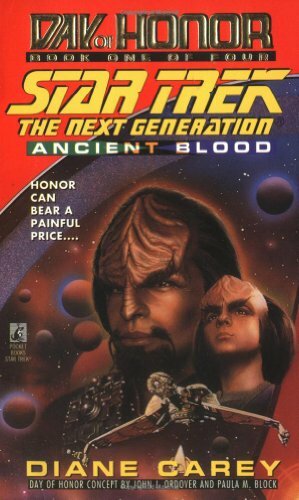 Along with his son, Worf must confront deadly danger -- and the inner struggles of his Klingon soul.